ERNEST CHAUSSON (1855-1899), Composer - Armin Jordan, Conductor, MainArtist - Nouvel Orchestre Philharmonique, Orchestra Copyright : 1991 Erato Classics S.N.C. 1986 Erato Classics S.N.C. ERNEST CHAUSSON (1855-1899), Composer - Armin Jordan, Conductor, MainArtist - Gino Quilico, Baritone Vocals - Nouvel Orchestre Philharmonique, Orchestra Copyright : 1991 Erato Classics S.N.C. 1986 Erato Classics S.N.C. ERNEST CHAUSSON (1855-1899), Composer - Armin Jordan, Conductor, MainArtist - Gérard Friedmann, Tenor Vocals - Nouvel Orchestre Philharmonique, Orchestra Copyright : 1991 Erato Classics S.N.C. 1986 Erato Classics S.N.C. ERNEST CHAUSSON (1855-1899), Composer - Teresa Zylis-Gara, Mezzo-soprano Vocals - Gosta Winbergh, Tenor Vocals - Armin Jordan, Conductor, MainArtist - Nouvel Orchestre Philharmonique, Orchestra Copyright : 1991 Erato Classics S.N.C. 1986 Erato Classics S.N.C. ERNEST CHAUSSON (1855-1899), Composer - Teresa Zylis-Gara, Mezzo-soprano Vocals - Gosta Winbergh, Tenor Vocals - Armin Jordan, Conductor, MainArtist - Gérard Friedmann, Tenor Vocals - Nouvel Orchestre Philharmonique, Orchestra - René Massis, Baritone Vocals Copyright : 1991 Erato Classics S.N.C. 1986 Erato Classics S.N.C. ERNEST CHAUSSON (1855-1899), Composer - Armin Jordan, Conductor, MainArtist - Thierry Dran, Tenor Vocals - Nouvel Orchestre Philharmonique, Orchestra Copyright : 1991 Erato Classics S.N.C. 1986 Erato Classics S.N.C. ERNEST CHAUSSON (1855-1899), Composer - Gosta Winbergh, Tenor Vocals - Armin Jordan, Conductor, MainArtist - Nouvel Orchestre Philharmonique, Orchestra Copyright : 1991 Erato Classics S.N.C. 1986 Erato Classics S.N.C. 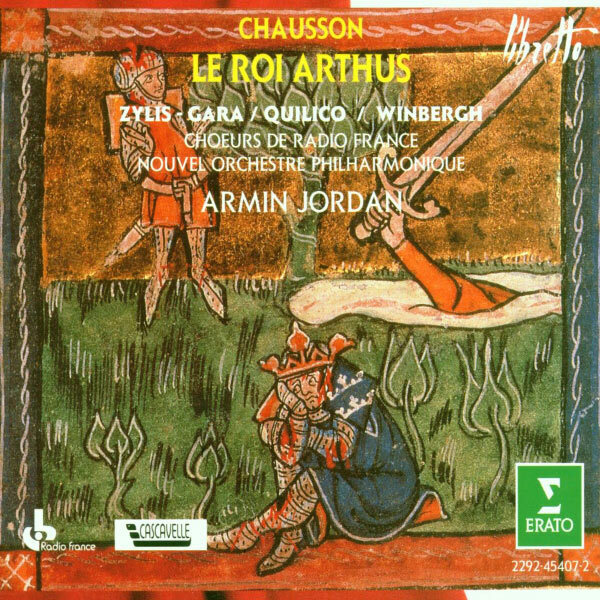 ERNEST CHAUSSON (1855-1899), Composer - Armin Jordan, Conductor, MainArtist - Radio France Chorus, Chorus - Gino Quilico, Baritone Vocals - Nouvel Orchestre Philharmonique, Orchestra Copyright : 1991 Erato Classics S.N.C. 1986 Erato Classics S.N.C. ERNEST CHAUSSON (1855-1899), Composer - Gilles Cachemaille, Baritone Vocals - Armin Jordan, Conductor, MainArtist - Gino Quilico, Baritone Vocals - Nouvel Orchestre Philharmonique, Orchestra Copyright : 1991 Erato Classics S.N.C. 1986 Erato Classics S.N.C. ERNEST CHAUSSON (1855-1899), Composer - Teresa Zylis-Gara, Mezzo-soprano Vocals - Armin Jordan, Conductor, MainArtist - François Loup, Bass Vocals - Nouvel Orchestre Philharmonique, Orchestra Copyright : 1991 Erato Classics S.N.C. 1986 Erato Classics S.N.C. ERNEST CHAUSSON (1855-1899), Composer - Teresa Zylis-Gara, Mezzo-soprano Vocals - Gosta Winbergh, Tenor Vocals - Armin Jordan, Conductor, MainArtist - Alexandre Laitter, Bass Vocals - Radio France Chorus, Chorus - François Loup, Bass Vocals - Nouvel Orchestre Philharmonique, Orchestra Copyright : 1991 Erato Classics S.N.C. 1986 Erato Classics S.N.C. ERNEST CHAUSSON (1855-1899), Composer - Teresa Zylis-Gara, Mezzo-soprano Vocals - Armin Jordan, Conductor, MainArtist - Nouvel Orchestre Philharmonique, Orchestra Copyright : 1991 Erato Classics S.N.C. 1986 Erato Classics S.N.C. ERNEST CHAUSSON (1855-1899), Composer - Armin Jordan, Conductor, MainArtist - Alexandre Laitter, Bass Vocals - Michel Focquenoy, Tenor Vocals - Radio France Chorus, Chorus - Francis Dudziak, Bass Vocals - Nouvel Orchestre Philharmonique, Orchestra - René Schirrer, Bass Vocals Copyright : 1991 Erato Classics S.N.C. 1986 Erato Classics S.N.C. ERNEST CHAUSSON (1855-1899), Composer - Gosta Winbergh, Tenor Vocals - Armin Jordan, Conductor, MainArtist - Radio France Chorus, Chorus - Gino Quilico, Baritone Vocals - Gérard Friedmann, Tenor Vocals - Nouvel Orchestre Philharmonique, Orchestra Copyright : 1991 Erato Classics S.N.C. 1986 Erato Classics S.N.C. © 1991 Erato Classics S.N.C.